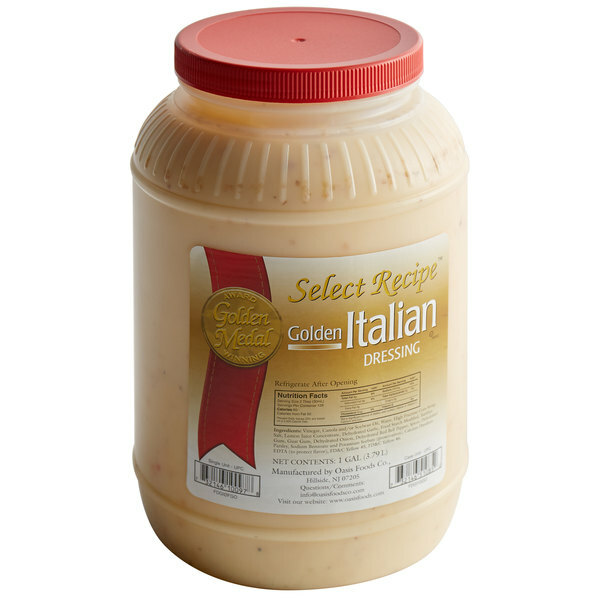 Add a burst of savory flavor to your dishes with this Oasis golden Italian dressing! Featuring fresh ingredients and zesty spices, this dressing can be added to a variety of dishes as a quick and easy way to enhance flavor. It fuses crisp vinegar and smooth oil lightly sweetened and spiced with savory garlic and pepper to deliver just the right amount of well-seasoned taste to your customers' food. It does not contain trans-fat or cholesterol. Unlike traditional Italian dressing that has a translucent, orange color, this golden Italian dressing features a light orange color and thicker consistency. Use this smooth dressing in savory sauces, marinades for meats, or for drizzling over salads. Since salads make such a popular menu item, it's important to satisfy your patrons with great-tasting dressings! Let this dressing seep into fresh breads to give any sub a satisfyingly tangy flavor. Your health-conscious customers will love golden Italian dressing-it offers all the rich flavor, herbs, and spices found in traditional Italian dressing but cuts out half the fat and calories! 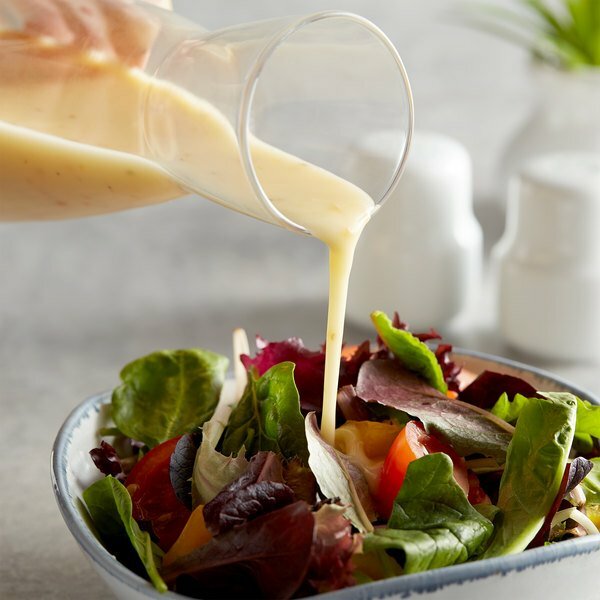 The zesty taste and smooth texture of this golden Italian dressing will delight your customers with the traditional tangy taste they know and love. Whichever way it's used, it's sure to add a flavorful kick to meals at your restaurant, salad bar, deli, or diner! This golden Italian dressing is comparable to any high priced brand. It tastes great and it's low cost. Highly recommended for any buffet, commercial kitchen or cafeteria. This golden Italian dressing tastes really great and it's nice that it comes in a one-gallon container. Good price for it as well. no complaints. This is a thicker Italian dressing. It has a good flavor, just as the regular Italian salad dressing does. The amount is great and especially it is for the price. This is a very thick italian dressing, not as watery as most. It is perfect for marinading chicken or other meats as well as for dressing up a salad. I really enjoy the flavor in this italian dressing. It's great for topping salads and as a fantastic marinade for pork, fish, chicken and even steak. This is the Italian dressing my customers have settled upon. They love the creaminess of it. And the great flavor. I love the cost of it. Its 15 dollars cheaper a case here, than from where i use to get it.